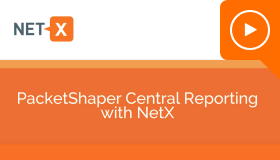 NetDialog’s NetX is a highly scalable, on-premises central reporting solution for the Symantec PacketShaper product family. NetX integrates with PacketShaper, ProxySG and MACH 5 products in order to collect application related information. These data are used to analyze and optimize the way applications are delivered to end-users. NetDialog has supported these devices for a long time already, where NetX has been the main reporting solution for PacketShaper environments. With a Blue Knight status NetDialog belongs to one of Symantec’s selected value added partners. In this video demo we show you how NetX for PacketShaper delivers unparalleled visibility into application & user behavior.